When Spanish immigrants Juan Moré and Carlos Menendez arrived in Florida, roughly a century ago, the Ybor City section of Tampa was filling up rapidly—with Cubans, Spaniards, Italians, and Germans, many them here to satisfy the almost insatiable employment demands of a growing cigar industry. Shortly after arriving, Moré went into the baking business, a few years later taking full ownership of Ybor’s ascendant La Segunda Bakery. Very soon after that, Menendez established Naviera Coffee Mills. Let us suppose you were to visit Tampa today, which would be a fine idea for many reasons, and we may begin with the fact that it can be quite warm and sunny there at this time of year, you will find both businesses not only still in existence, you will find them still family-owned, and thriving. Tampa has changed greatly during the last one hundred years, but one thing has not ebbed, in the slightest, and that is the city’s nearly limitless appetite for Cuban bread and café con leche, one of the simplest, most satisfying traditional regional breakfasts in the country, served very nearly everywhere, and in copious quantities at La Segunda’s original bakery, on the northern fringe of Ybor. No matter how fresh, the bread is split, buttered liberally, pressed within an inch of its life, then served up hot in generous portions. 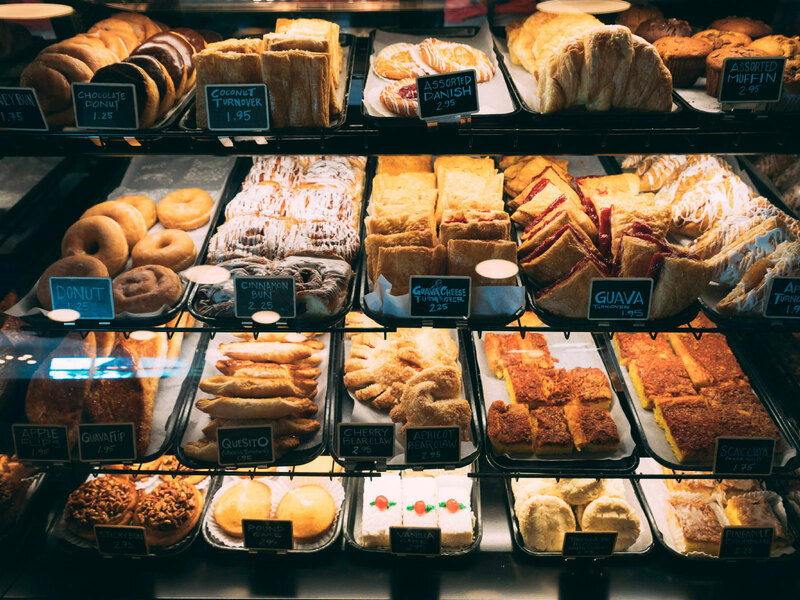 It’s not like every cafe, bakery or restaurant in the older Tampa neighborhoods serve La Segunda bread, or Naviera’s rich, dark coffees—only most of them. And that’s just how you start the perfect day of eating, here in Tampa. From legendary salads—mixed table side with a piquant, Worcestershire-laced dressing—at the Columbia Restaurant, dating back to 1905, to late-night ropa vieja combo dinners for a few bucks at the frill-free La Teresita, to generous, $3.80 Fritas at the West Tampa Sandwich Shop, where they’ll call you honey ten times in a half hour, Tampa and the old Cuban/Cuban-ish ways—are nearly inseparable, and here it is, all for the taking. Assuming you know what to look for. There are plenty of places across the country where you will find people honoring tradition, and particularly food heritage, without thinking much of it; there are entire tourism economies built around this very idea, most notably New Orleans, where looking back is very nearly a religion. Tampa, like many a Sun Belt city, tends to go in for new, shiny things, and to be fair, there are plenty of them. Those confessing an interest in the city’s past will likely be pointed toward Ybor City, which has the cigar factories with their little coffee counters (Tabanero’s the one you want), and of course the Columbia Restaurant, standing by the neighborhood through thick and thin, and there is Seventh Avenue, too, with its underutilized and impressive collection of historic architecture. For a number of reasons, however, none of them very good, the recent decades have not been particularly kind to commerce in the neighborhood, and while many efforts have been made, today, the culture that once made Ybor one of the most vibrant places in Florida is now far more dispersed. You don’t come here looking for a French Quarter-type experience—the truth is out there, but it’s often found over the Hillsborough River, in West and South Tampa, and has been for a very long time; there are sections of that part of town where it feels like you are running across a historic cigar factory building every couple of blocks—Ybor may have started it all, but clearly could not contain it, and it certainly does not do so today. But Ybor’s inability to compose itself in a meaningful way, to make itself completely useful to tourists should not be read into, not very deeply, anyway—old Tampa is very much alive, it is just less neatly packaged than some might prefer, a story as old as the modern American city. All over town, you will find very good restaurants and cafes, essential throwbacks that remain a part of daily life here, as inseparable from the local experience as their counterparts in more appreciated places like New Orleans and San Antonio or Santa Fe, or the very old cities of the Mid-Atlantic, or any other place where tradition still matters, and matters a great deal. If you are able, you should come here, and you should dive in, and experience all of it; here are just a few essential stops to get you up and running. A slow, deliberate process—8-10 hours, from start to finish—is behind the creation of Tampa’s favorite bread, a process executed day after day, year after year, by a small army of men who still do very nearly everything by hand, the human equivalent of a well-oiled machine. Roughly 18,000 loaves—each with its own trademark palmetto frond laid on top, to create the all-important split—come out of the original Ybor City location every day, to be quickly dispersed all over town, but you can’t beat going to the source. The original bakery has a retail counter, and you can get everything you need here, but a new South Tampa cafe, sometimes referred to the bougie La Segunda, with its stroll-up coffee bar, live baking station and a comfortable couch in the window, not to mention an expanded menu, works great, too. At either location, you will find plenty of the Cuban classics, all the things with guava and/or cheese that you could want, really, but you’ll also note plenty of influences from other immigrant communities, too, from German chocolate cake, to New York-worthy rainbow cookies to square slices of scacchata, a vintage Tampa take on a tomato pie that still flies off the shelves here. These days Florida’s oldest, Ybor's unwavering anchor rests comfortably atop an impressive empire, stretching all the way from Sarasota to St. Augustine. The Columbia story, however, which begins way back in 1905, is a story of survival, a story of immigrant entrepreneurs shrewdly navigating their way through Prohibition, the Great Depression, and decades worth of flight into suburbia. More than a century and five generations later, Tampa’s best-known address for Spanish-Cuban dining remains a family affair; it is also one of the city’s most memorable places for a leisurely lunch, preferably in the sun-lit Patio dining room, where well-dressed waiters will mix your iceberg lettuce salad as elegantly as if they were carving duck a l’orange in Paris—a Paris that barely exists, anymore. Try the devil crab croquetas, a Tampa original, one that’s becoming increasingly difficult to find, at least done well. 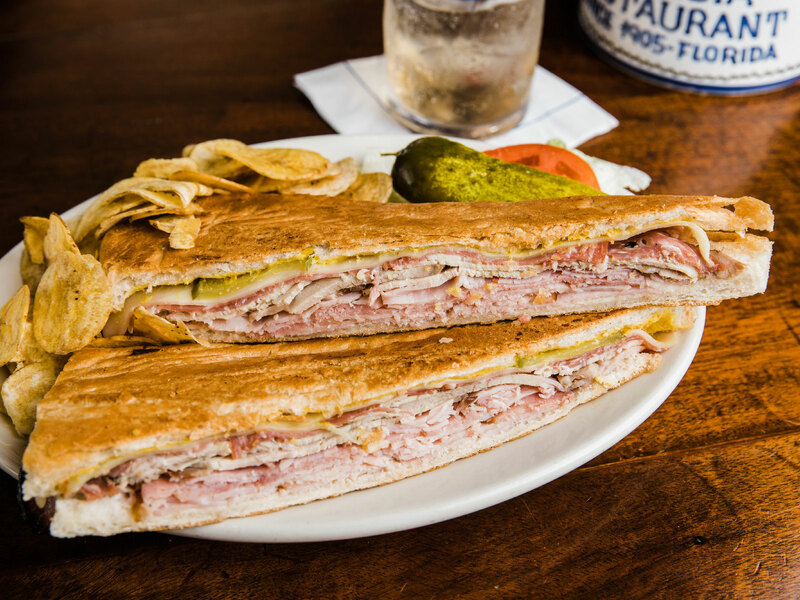 Of course you’re having the iconic Cuban sandwich, a generous tribute to Ybor’s mixed cultural heritage, made to the restaurant’s own 1915 recipe. Cool weather makes a hot meal taste more delicious. Try our Arroz Caldoso con Mariscos, a flavorful Andalusian “brothy rice” made with Gulf of Mexico shrimp, sea scallops, fresh calamari, Mahi Mahi, pulpo (octopus) Maine Lobster and chorizo, then simmered with extra virgin olive oil, green peppers, tomatoes, garlic, and saffron. This modest Columbus Drive lunchroom is a firm favorite not only here at the heart of Cuban West Tampa, but far beyond, as well—who wouldn’t love a place where a hand-written specials board touts pig’s feet, lamb shank, and whole fried red snapper, all at extremely reasonable prices? Many diners keep it simple, with classics like the bistec de palomilla, butterflied and marinated round steak served—like most everything else—with healthy portions of yellow rice and black beans, or your choice of plenty of other side dishes. Consider the fried rice, a delicious holdover from a time when the menu here skewed more Cuban-Chinese. Next to some of its local peers, West Tampa’s most popular Cuban restaurant feels something like a brash young upstart, and that’s because it is—founded by Castro-fleeing refugees as a market, back in the 1970’s, what you find here today is a multi-venue, multi-sensory experience, all happening at a relatively fast, shades-of-South Florida pace, which can be something of a surprise after your wanderings through Tampa’s relatively mellow scene. Don’t be put off—the cafeteria, with its horseshoe shaped counters and very late hours, is an essential part of the local experience, offering perhaps not the finest food, but certainly some of the best value for money, and some of the best all-day (and on weekends, all-night) people watching in town. Give me all the Cuban food. 🍴 *Tostones not pictured.